As part of World Landscape Architecture Month, NCASLA is hosting the 2019 Golf Tournament & Social on April 26. 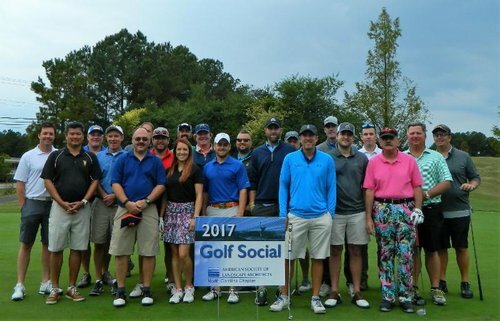 To be held at The Crossings Golf Club in Durham, this tournament is sure to offer a good time and even better networking! Registration is now open for the ASLA Southeast Regional Conference! 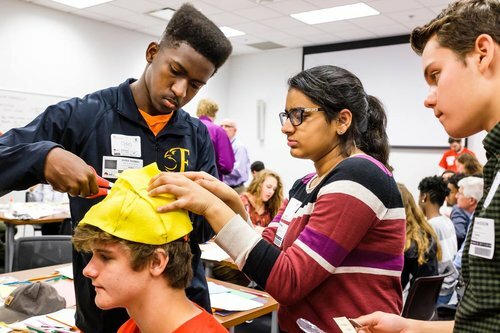 As part of World Landscape Architecture Month in April, NCASLA is partnering with Wake County Public Schools (WCPSS) to host their 4th Annual WCPSS Design Blitz. For more information on the Design Blitz and how to get involved, please click here. The North Carolina Chapter will be taking over the National Instagram account on April 5th! Keep an eye out! Join SiteOne Landscape Supply for a free one-hour course designed to provide you with a basic understanding of natural stone thin veneer application. During this course you will also explore the natural stone’s beauty and durability, learn the history and best uses for different types of stone veneer, how thin veneer is produced and common application techniques. After the one-hour classroom portion, we invite you to join our hands-on demonstration of proper installation techniques in our outdoor display. We will also have a lunch without course speaker, facility tours, opportunities to sign up for our monthly plant availability list, and you can meet key suppliers who will be on site. 12660 US 64 Hwy., E.
Plan to attend the Richard C. Bell lecture by Kurt Culbertson of Design Workshop entitled "Toward an Ecology of the City"
Kurt Culbertson, Chairman and CEO of Design Workshop, an urban design, land planning, and landscape architecture firm with offices in Aspen, Colorado, and nine other cities. Mr. Culbertson received his Bachelor of Landscape Architecture degree from Louisiana State University and a Masters of Business Administration with an emphasis in Real Estate from Southern Methodist University. He is currently pursuing a Doctorate in Landscape Architecture from the Edinburgh College of Art. Mr. Culbertson is a former Fulbright scholar, and a fellow of the American Society of Landscape Architects, the American Institute of Certified Planners, the Urban Design Forum, and Dumbarton Oaks. He has received 35 national and state awards for his work, including the Pierre L’Enfant Award for International Planning from the American Planning Association and the 2013 Award of Excellence in Planning from the American Society of Landscape Architects. In 2016, he was awarded the ASLA Medal – the highest honor bestowed on a member of ASLA. View the lecture program with more information about the speaker, the lecture and links to other LAR lectures. Continuing Education credit will be available for the lecture. SiteOne is hosting a one-hour course on natural stone veneer at their Mooresville location on March 28th from 11:30am to 1:30pm. There will be lunch with the speaker, facility tours, opportunities to sign up for their monthly plant availability list, and you can meet key suppliers on site as well. This event will be available for 1 LACES HSW credit. Please keep a look out for an EVITE and RSVP by March 20th so SiteOne can plan accordingly for food. Keynote Speakers: Governor Roy Cooper, Wilmington Mayor Bill Saffo & New Hanover County Commissioner Jonathan Barfield, Jr.
Design thinking can play a key role in building strategies to address the issues brought on by climate change, such as sea level rise, severe storms, flooding, fires, and drought. The nature of these issues demands a diversity of views and multidisciplinary approaches in order to develop innovative solutions that can strengthen communities’ resilience. Although it is a short time frame, DesignSprint offers a dedicated forum for exploring the possibilities of fun, intensive, and collaborative work in service to designing solutions to one of the grand challenges of our time. It is a continuation, and an adaptation of the previous DesignWeek model but will emphasize process and encourage ideas in addition to our previous efforts visualizing living with floods. We welcome NCASLA Members to participate during DesignSprint. We realize that not everyone can participate for the entire 4-day period. We are most interested in your availability in the afternoon of Wednesday March 20 (to advise students) and/or the morning of Saturday March 23 (to serve as the jury reviewing team proposals). The survey will ask at what level you are able to participate and your preferred topic. This information will be used for planning so please try to fill out the survey as soon as possible. Although the context of this effort is climate change, the emphasis of DesignSprint 2019 is on BIG IDEAS. Over four days, we hope to simulate the combinations of talent and skills needed to generate, interrogate, and share creative ideas that could lead to solutions to combat the impacts of climate change. No one is expecting the answer to these complex challenges in a compressed time frame. However, BIG IDEAS, well thought through and articulated, can alter conversations, point in unexplored directions, and lead to unexpected consequences as we strive to address one of the grand challenges of our time. Hence Design Sprint 2019 will offer a program that includes workshops/work sessions, expert consultancy, and inspiring talks and conversations from March 20 to March 23, 2019. Please join us on Tuesday, March 19 for the Design Sprint keynote lecture by Ignacio Bunster-Ossa of AECOM entitled "Living with Climate Change, By Design". The lecture will begin at 6:00 pm in Burns Auditorium. Ignacio Bunster-Ossa is Chair of the Task Force on Climate Change at the Landscape Architecture Foundation (LAF). Based in Arlington, Virginia, Ignacio leads AECOM’s national practice in landscape architecture. He is recognized professionally for award-winning work spanning regional open space, communities, parks, plazas, waterfronts and streetscapes. Noted projects include the Anacostia Waterfront Initiative, Georgetown Waterfront Park in Washington, D.C., and the SteelStacks Arts and Cultural Campus in Bethlehem PA - which received the Brunner Award and the ULI Global Award of Excellence. He is co-author of Green Infrastructure: a Landscape Approach, and Reconsidering Ian McHarg: the Future of Urban Ecology, published by Planners Press. Attached is the Bunster-Ossa lecture program with more information about the speaker, the lecture and links to other LAR lectures. Join other Triangle Section members for a beers and networking at Bond Brothers in Cary. Jordan Gussenhoven with Chatham Street Commercial will be joining us to tell us a little bit about what they have been working on in the Downtown Cary area. There’s no cost to the event, and drinks are on your own. Fountains are beloved features in many public places and contribute to quality of life while adding environmental benefits, particularly during hot summer months. However, many parks departments and commissioning bodies shy away from installing them due to the perceived high cost of installation and ongoing maintenance. Some recurring questions neighborhoods may face are whether alternative funding models can keep the water flowing if a city or town won’t perform regular upkeep. What are the impacts of a dormant fountain? What are the environmental effects, both positive and negative? We will explore these questions, explain the typical pool, pass through and recirculating systems, and share insights on sustainable best practices. Understand the social value of fountains and water features while balancing the economic and environmental costs of designing and maintaining them in the context of sustainability and the Triple Bottom Line (TBL). Familiarize oneself with the basics of water feature layout and design to understand the requirements of equipment maintenance and minimize water waste. Provide some examples of converting non-sustainable water features into sustainable ones through recirculation, filtration, and active management. As part of World Landscape Architecture Month, NCASLA is organizing a month-long “Instagram Takeover” to feature the work of our state’s firms! The takeover will be held from April 1 - April 30, 2019. Members will have the opportunity to “take over” the NCASLA Instagram account for at least one day, showcasing their work through posts of their choosing. The takeover will be similar to the Instagram takeover that National ASLA has organized in the past. This will help NCASLA improve our social media content, increase our follower base, and improve awareness about the exciting work that our members are doing in NC and beyond! If you would like to participate, please contact us at manager@ncasla.org by March 11, 2019. You may post up to 7 posts per day, and an unlimited amount of Instagram stories. Feel free to include multiple images or videos in each post. NCASLA may share your Instagram posts to Facebook and Twitter. Post only landscape architecture related content. Please tag your business account and the accounts of those you have collaborated with, if applicable. We highly encourage you to tag all the allied professionals you have worked with on your project such as, but not limited to, planners, engineers, surveyors, soil scientist, ecologists, general contractors, landscape contractors and your clients! Be sure to provide image credit where applicable. By participating in NCASLA’s Instagram Takeover, your firm gives NCASLA permission to use posted images for other NCASLA initiatives (including, but not limited to, Advocacy Day publications). Please join us for an informal NCASLA Coastal section gathering. We can talk about interests and ideas for the coming year. Christine Ten Eyck of Ten Eyck Landscape Architects in Austin Texas will be speaking on Wednesday, February 27 at 6 pm in Burns Auditorium. Ms. Ten Eyck is known for her pioneering use of native desert plants in southwest landscapes and more recently for her rigorously sustainable campus projects. Building design professionals are increasingly adopting Building Information Modeling (BIM) in their projects and asking Landscape Architects to use the same processes. This workshop will introduce site-specific BIM processes and describe how current technology supports Landscape Architecture professionals as they use these workflows in their site design, analysis and documentation. Participants in this workshop will learn how imported files from allied professionals can be converted to information modeling objects, such as digital terrain models (DTM), from which design and analysis can proceed. Discover how quickly parametric objects, like walls with constructed components, can be utilized to affect the other smart hybrid objects in proposed site development. Realize efficiencies gained by using referenced viewport tools to develop enlarged plans and live section views, further linking documentation throughout the project. https://www.vectorworks.net/trial/form to do the same. Learn how to protect your property and improve the natural environment by stabilizing the stream in your backyard. Learn from NC State University experts about practical, cost-effective solutions using natural materials and native plants to create a healthy streamside environment. Join Triad Section members for a networking social to be held at Sixth & Vine Wine Bar. Daniel Vasini of West 8 Urban Design & Landscape Architecture will address the critical role of landscape architecture within the context of large-scale urban master planning and design, the legacy of American campus design and Innovation Districts. The Coastal Section event will include a core Introduction to SITES presentation, with supplemental presentations themed around the Restore Aquatic Ecosystems credit. The Triangle Section event will be hosted at NC State University’s renovated Talley Student Center, which is double-LEED Gold certified. There will be a core Introduction to Sustainable Sites presentation, followed by presentations from Emily McCoy, PLA, SITES AP and the NCSU MLA Design+Build Studio. The Triad Section event, will take place at the new Student Center at NC A&T University. It will feature a core Introduction to Sustainable Sites presentation followed by Low Impact Development and ecosystem service presentations. Katie Rose with Leaf & Limb will be joining us to give a presention on tree preservation and regulatory compliance. This presentation demonstrates current research into tree preservation, reviews regulations surrounding tree preservation and engages participants in assessing and categorizing the effectiveness of regulations on the preservation of trees. During the presentation, participants analyze the effect of development on trees, compare and contrast tree preservation regulations across municipalities and assess what information and actions are needed for successful tree preservation and regulatory compliance in all stages of projects. At the conclusion, participants demonstrate a theoretical and technical understanding of how to preserve trees successfully while meeting local regulations. The Charlotte Section event will be hosted at Camp North End. Once used to produce Model Ts and Army missiles, this 76-acre historic industrial site now serves as a hub for creativity and innovation in the heart of Charlotte’s North End Smart District. The Mountain Section event will feature a core Introduction to Sustainable Sites presentation, with ecosystem service presentations, and an exclusive tour of the Sierra Nevada Brewing Co. LEED Platinum brewery and grounds. Learn, celebrate, and connect at the world’s largest gathering of landscape architects! Building a living urban landscape that succeeds is a ridiculously difficult assignment. Plants don’t want to be in the city, urban fill is stubbornly infertile, buildings make miserable microclimates, motors spew fumes, and climate change mangles best laid plans today and tomorrow. Why would anyone be nuts enough to try? It’s because landscapes, when they thrive physically, socially, and culturally, make some of the most magnificent places in the city, with no prejudice toward background, income, nationality, or personal preferences. The noble causes of sustainability and resiliency have created expectations that landscapes must perform– -and they should as much as they can– -but each in its own way, giving landscape architects the latitude to think out of the box about ecology, the environment, and place. Using three landscapes in Toronto, Laura will share the trials and pleasures of making outdoors spaces that are functional but also strive to be loved. The Landscape Architecture Lecture Series is produced by the department of Landscape Architecture in partnership with the Student Chapter of the American Society of Landscape Architects and the Landscape Architecture Advisory Council. Laura is widely regarded as an expert in the field of landscape technology and sustainability, and her leadership and knowledge inform the design, construction, and post-construction maintenance of MVVA’s projects. Her particular areas of expertise include the integration of stormwater management, complexities of on-structure landscapes, use of sustainable soil, innovative approaches for landscape materials, and techniques for organic maintenance. In collaboration with Matt Urbanski and Michael Van Valkenburgh, Laura serves as a managing principal for planning and design projects from their earliest phases and oversees the technical aspects of MVVA’s landscapes firm-wide.